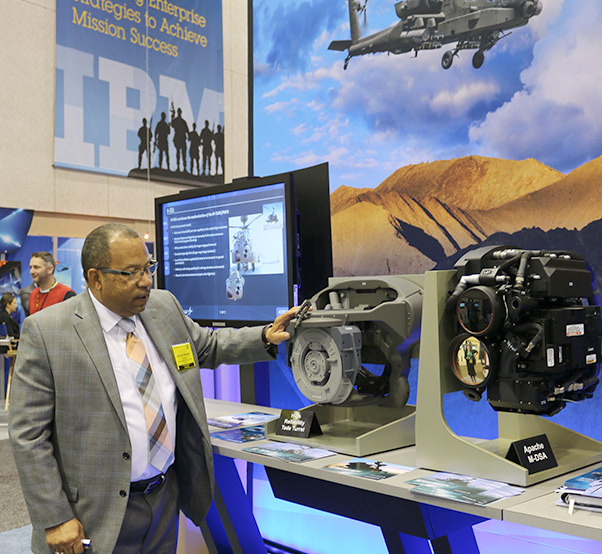 Gregory Walker of Lockheed Martin explains the two new technologies that will be introduced with the E model of the Apache (AH-64) attack helicopter during a media event at the Association of the U.S. Army’s Institute of Land Warfare Global Force Symposium and Exposition at the Von Braun Center in Hutnsville, Ala., on March 17, 2016. The system at foreground right is the Modernized Day Sensor Assembly (M-DSA) and the system at background right is the High Reliability Turret. The Apache attack helicopter is flying into the future with enhanced sensors and a more reliable turret that improves the aircraft’s 40-year-old technology. During a media event at the Association of the U.S. Army’s Institute of Land Warfare Global Force Symposium and Exposition at the Von Braun Center in Huntsville, Ala., March 17, Apache project manager Col. Jeff Hager of the Program Executive Office for Aviation and Lockheed Martin officials explained the need for modernizing the sensor and turret technology on one of the Army’s most successful mission-focused aircraft. The Modernized Day Sensor Assembly (M-DSA) and the High Reliability Turret will be available to Apache (AH-64) pilots in the aircraft’s E-model, which is scheduled to go into manufacturing in fiscal year 2019. They will then be installed in earlier models as funding and schedules allow. Forty years ago, the Apache sensors that allowed advanced visibility both in daytime and nighttime conditions, and the turret that communicates sensor data to the pilots were state-of-the-art, giving Apache the technological edge over any other aircraft of its day. “New technology has evolved. Obsolescence issues have creeped in with existing technology. So, it’s time to address the issue,” said David Belvin, Apache Programs director for Lockheed Martin Missiles and Fire Control, which is developing the new technologies for the Army. • Support two-level maintenance so that most repairs can be made directly on the flight line. “The sensor’s laser pointer will move to the gimbal to make it more accurate,” Belvin said. With the new technology, “it is easier for the guy under combat, under stress, to have a smoother transition between the day side or FLIR (Forward Looking Infrared nighttime vision) change over with zoom out or zoom in. Right now, there is too much transition between the day side and night side,” Hager said, referring to the day and night sensors not transitioning at the same view position. For example, he said a pilot looking with zoom in with the day sensor must readjust to zoom in when moving to the night sensor, and during that transition runs a great possibility of losing the zoomed in target. The new blending capability between the day and night sensors, the addition of color to the video, the picture-in-a-picture capability and other new features “offer better situational awareness that allows them to lock on and track targets much faster,” Belvin said. Those new features have been tested by the PEO-Aviation at Redstone Arsenal. One of those tests showed the new sensor’s long-range view, picture-in-a-picture and laser pointer capabilities as they were used to take video inside a darkened hanger from six miles away. With the existing sensor, shadows inside a hanger keep pilots from getting a good view. 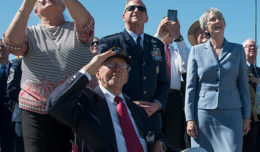 But with the new sensor, the pilots can see through the shadows to view people and even the kinds of weapons or other equipment those people may be carrying, Hager said. “This is going to be a great asset to the user,” the colonel said. Although the sensor modification offers plenty of new capability for the Apache pilot, it also hits on a big must-have for the Army: saving money. “The key is helping with operating and support costs long term. Two-level maintenance really brings down Operation and Support costs over time,” Belvin said. 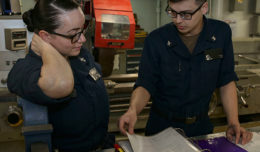 Two-level maintenance refers to the level of maintenance that can be accomplished in the field and the type of maintenance that must be performed at the Army depots. With two-level maintenance, more maintenance is done in the field, with costs lowered and readiness increased. Same is true with the High Reliability Turret, which exactly aligns sensor data with the movement of the pilot’s head. The technology improves on both capability and two-level maintenance, Belvin. With the existing turret, there is a slight lag between head movement and pilot data, he said. And, most maintenance to the turret requires that the entire nose of the helicopter be removed to gain access. “The huge improvement on maintenance will save $500 million in Operation and Support cost over the life time of the systems because of two-level maintenance,” Belvin said. It will also minimize the need for spares, he said, because repairs can be made to the turret itself. “The new turret replaces obsolete, legacy components,” Hager said. “These are legacy gimbal assemblies” that are being replaced. Belvin and Hager also talked about the effect performance based logistics has had on savings costs and improving readiness. The Apache Performance Based Logistics program received recognition in 2011 and 2013 as one of the best in the Army. “Apache PBL is leading the way relative to support concepts, and providing lessons learned for other aircraft,” Belvin said. Operational readiness for Apache in theater is in excess of 80 percent because of Performance Based Logistics, Hager said. During a briefing with the 101st Airborne three weeks ago, the colonel said, leadership reported “the highest operation rates in combat training and combat environment and that’s all thanks to PBL. It really is helping us in keeping the aircraft flying” and keeping down costs per fly hour.